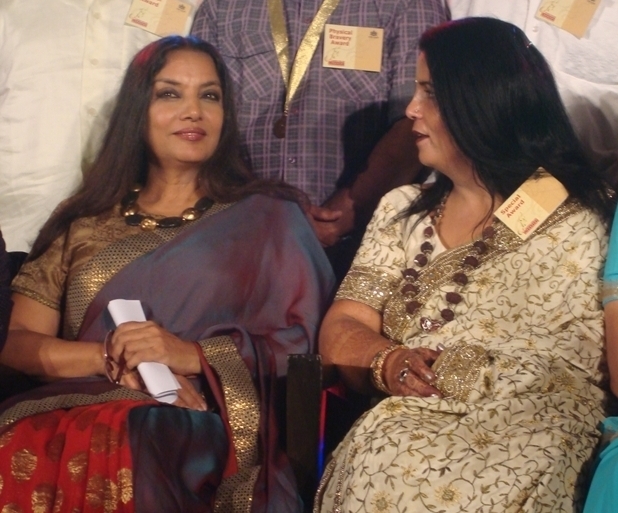 On 29th September 2010 famous actress & social worker Shabana Azmi presented the 18th Godfrey Phillips Bravery Award to Suniti Yadav in a glittering ceremony in Hotel J.W. Marriot in Mumbai. 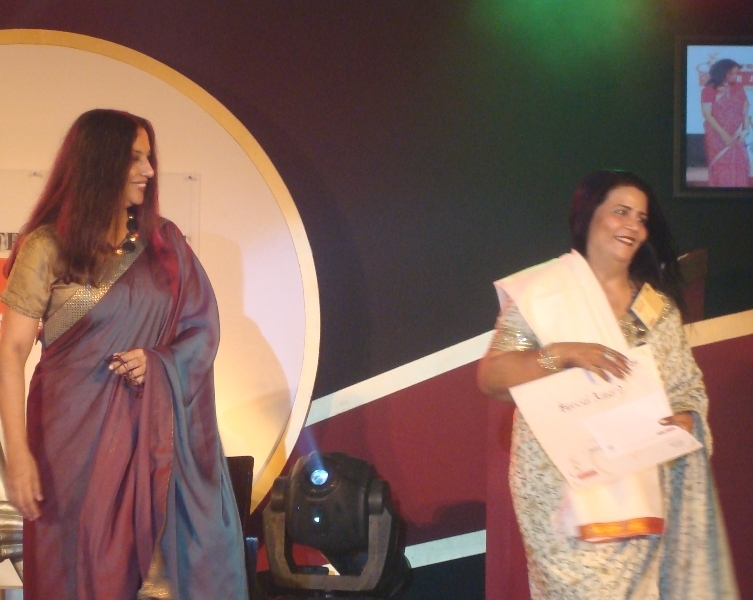 Mrs Yadav has received the awards in Social Acts of Courage category.
'' The objective of Godfrey Phillips Bravery, a Corporate Social Responsibility initiative of Godfrey Phillips India, is to encourage the culture of selfless action, to empower the less fortunate and build a compassionate and caring society. With the belief that women are the architects of society, the awards also emphasizes women empowerment." said K K Modi, President of Godfrey Philips India. Each year, the task is to encourage people to help those who are in need. This help doesn't only mean physical bravery. The awards recognise bravery in four categories - Physical Bravery Award, Social Bravery Award, Mind of Steel Award and Social Lifetime Achievement Award. Mrs. Suniti Yadav the Tree Woman of India is the Founder of Eco- feminist Movement in central India. About 20 years ago when there was no environment for environment in Chhattisgarh /M.P. region she realized importance of religious sentiments for forest protection and successfully blended it with her conservation movement, so that both religion and the environment can be upheld.
. With her basic philosophy "Trees are our brothers" she is organising "Tree Protection Festival " every year since 1992. She has sensitized wide cross section of our society specially women - the major stakeholders in environmental problems that " Protection of mature trees are as important as planting new ones". For protection of trees as our own brothers she launched "Vriksha Raksha Sutra Programme" .In this programme people use to tie sacred threads [Rakhi] around trees and pledge their protection.The programme is recognised by media as New Wave of the Chipko Movement because what it is trying to conserve is not merely few trees here and there but the entire life support system and with it, the option for human survival. In 1988 she launched Sacred Grove Conservation Movement [SGCM] and Varistha and Vishistha Vriksha Yojna [ Very Important and Peculiar Trees Programme. In 1993 she started Paudh Prasad Pariyojna in which saplings were distributed as Prasad from religious places. These saplings are well protected and their survival rate is very high. Now days she is actively pursuing people and public representative for creation of Vriksha Adalat [Tree Courts] in every Municipal Corporations and Urban Bodies to respect and protect the Rights of Trees to find some sustainable solution of our environmental problems . She has received many national and international awards like prestigious " Maharana Udai Singh National Environmental Award - 2004 , Stree Shakti Puraskar 2002, Zee Astitva Award 2007,. Bharat Gaurav Award, Rajiv Gandhi Excellence Award,.On the eve of International Woman Day [8th March 2005] the Hindustan News Paper New Delhi has recognized her as the Tree Woman of India. The largest Hindi news paper group of India Dainik Bhaskar has included Mrs. Yadav in the list of Top 10 Indian Women Achievers of 2007 , The Rawatpura Sarkar Trust and the State Women Commission Chhattisgarh have also honored her in 2009 and 2010 respectively. The United Nations Environment Programme [UNEP] Kenya and Convention on Biological Diversity [CBD] Montreal Canada have appreciated this programmes for nature conservation. Other recipients of Godfrey Phillips Bravery Awards were late Rev Father Thomas Fernandes [Goa], Ganesh Sambherao (Maharashtra] Nikita Mahawar [Chhattisgarh] for physical bravery; Mahilashram from Goa; for Social Acts of courage; Sindhutai from Maharashtra received the Mind-of-Steel award; Anand J Shinde; Prakash C Gidwani; Shailesh Bhatt and Mahendra Mane from Maharashtra. The Award includes a Merit Certificate and a cheque of Rs. 50000 .The awards were presented in order to pay tribute to these men and women, who are an inspiration to all other citizens of the country, to live with courage and honour. All legal matters are subject to Bhopal Jurisdiction at Bhopal District Courts only .